This big and beautiful hamsa necklace is sure to make your outfit stunning! 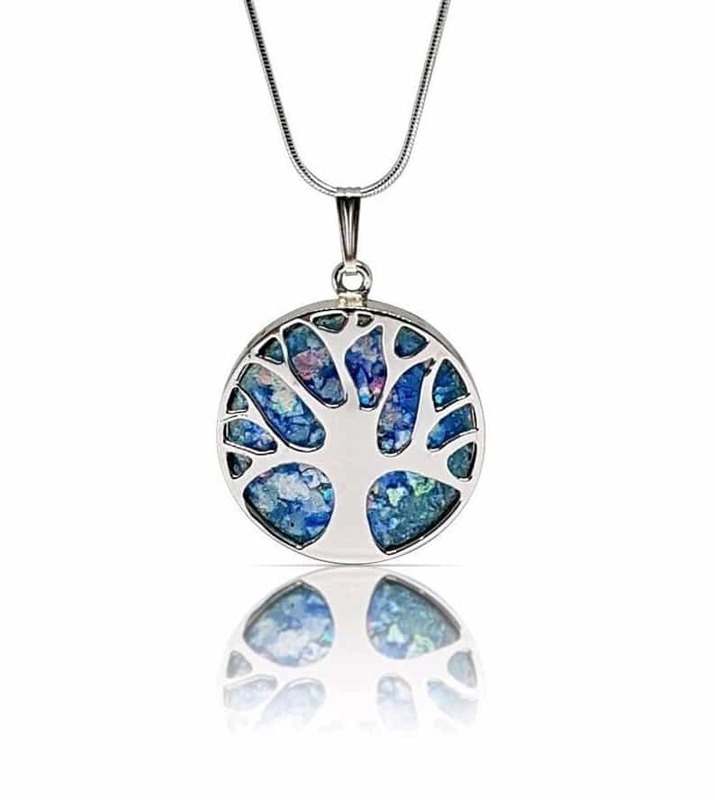 Set on a silver plate, the pendant is adorned with different colored beads and crystals in pretty shades of blue, turquoise, green and purple. Adorned with flawless, unblemished beads on a silver frame, this Hamsa design with crystals lightens up your outfit. It even lightens up your mood with glossy-colored schemes. The Hamsa design with crystals is an ideal gift. It poses a gift for anyone. For instance it could be a gift for someone celebrating a birthday, wedding or any other joyful occasion. The Hamsa crystal adornments places itself on a silver frame. The crystals give a vibrant and definitive finish to the Hamsa design. The Hamsa design represents the spiritual aura of all things good, love, peace, happiness, luck, etc. It functions as a repellent to darkness. It also protects from negative power, hate, doubt of the good, misfortune etc. The Hamsa design with crystals depicts the symbolic sign of Hamsa. It is the Palm of a hand with the thumbs in a symmetrical place. This divine piece of jewelry holds strong religious significance to its Jewish heritage. The Hamsa design with crystals features an intriguing crystal matrix placement pattern. It is notable from the works of renowned jewelry artist, Yair Emanuel. Yair Emanuel is a famous Judaica artist. His works were creative and expressive work of art. He works on silk, wood and textiles. But he is famous for his paintings on raw silk. Yamir Emanuel's works are so popular. Therefore the Jerusalem high court fined a company $35,000 for illegally replicating his works. From the hands of master craftsman the intricate beauty of the crafted Hamsa design with crystals. The Hamsa design embroidered with crystals, suspends from the length of a silver chain. Its inter-woven between a grip gets attached to the Hamsa structure. The Hamsa design with crystals worn for casual and formal outings, due to its material quality and style. Its best suited for informal occasions. It goes well with a luxe blue outfit and application of other accessories can blend with the pendant. With not too bold color schemes the Hamsa design with crystals is suitable for simple-elegant people. Adorned with flawless, unblemished beads on a silver frame, this Hamsa design with crystals lightens up your outfit. It even lightens up your mood with glossy-colored schemes. 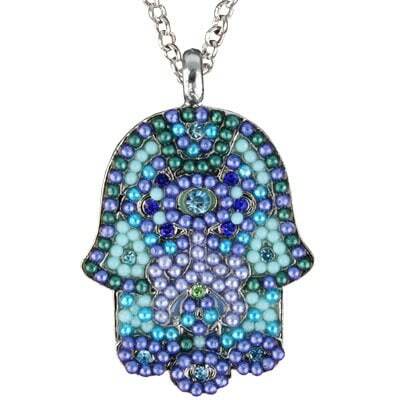 The Hamsa design with crystals is an ideal gift. It poses a gift for anyone. For instance it could be a gift for someone celebrating a birthday, wedding or any other joyful occasion. The Hamsa crystal adornments places itself on a silver frame. The crystals give a vibrant and definitive finish to the Hamsa design. The Hamsa design represents the spiritual aura of all things good, love, peace, happiness, luck, etc. It functions as a repellent to darkness. It also protects from negative power, hate, doubt of the good, misfortune etc. The Hamsa design with crystals depicts the symbolic sign of Hamsa. It is the Palm of a hand with the thumbs in a symmetrical place. This divine piece of jewelry holds strong religious significance to its Jewish heritage. The Hamsa design with crystals features an intriguing crystal matrix placement pattern. It is notable from the works of renowned jewelry artist, Yair Emanuel. Yair Emanuel is a famous Judaica artist. His works were creative and expressive work of art. He works on silk, wood and textiles. But he is famous for his paintings on raw silk. Yamir Emanuel’s works are so popular. Therefore the Jerusalem high court fined a company $35,000 for illegally replicating his works. From the hands of master craftsman the intricate beauty of the crafted Hamsa design with crystals. The Hamsa design embroidered with crystals, suspends from the length of a silver chain. Its inter-woven between a grip gets attached to the Hamsa structure. The Hamsa design with crystals worn for casual and formal outings, due to its material quality and style. Its best suited for informal occasions. It goes well with a luxe blue outfit and application of other accessories can blend with the pendant. With not too bold color schemes the Hamsa design with crystals is suitable for simple-elegant people.